Participants sing during the opening worship of the 2012 United Methodist General Conference held in Tampa, Fla. A UMNS photo by Kathleen Barry. TAMPA, Fla. (UMNS) Nearly 1,000 United Methodist delegates gathered April 24 beside Tampa Bay for a 10-day conference to consider 1,200 petitions that will determine the manner in which the 12.1-million-member denomination orders its ministry, structures its agencies and addresses social justice issues for the next four years. Delegates from the United States, Europe, Africa and the Philippines opened the session with the Sacrament of the Lord's Supper and an address by Charlotte (N.C.) Area Bishop Larry M. Goodpaster, president of the Council of Bishops. In keeping with the seaside location of the Tampa Convention Center, worship services over the next two weeks will recall the many occasions Jesus' ministry occurred by the Sea of Galilee. Sights and sounds from three large screens across the front of the assembly hall enable delegates to feel as if they are seated on a seaside. In the opening service, Goodpaster recalled how James and John, the sons of Zebedee, "just walked off the job and went off with this itinerant rabbi from Nazareth. "Like the first four by the Sea of Galilee, we have gathered beside Tampa Bay to clean and mend our nets," said the bishop. "It is our business because once every four years we have this need to get together to amend and fix the nets we know as United Methodism." Goodpaster suggested that the analogy of net fishing may make some church members uncomfortable. "Our tendency has been to fish for only one fish at a time a certain kind of person, namely one who is like us whatever 'us' is. But the mission on which Jesus sends us is to embrace, and live out the good news of God's love for all the world, and for all people wherever and whoever they may be. It is our mission. And immediately." The opening worship service used video, sound and strobe lights to simulate lightning that would strike during violent storms on the Sea of Galilee. The symbol was also appropriate since lightning strikes the Tampa area more than any other area in the United States. And some historians believe the word "Tampa" is a Calusa Native American word that means "sticks of fire," a reference to the many lightning strikes. During several pre-conference orientation sessions, delegates expressed concern that some of the legislative sessions could also be stormy as they consider a proposal that would radically reshape the manner in which 13 general agencies are organized to provide resources for the 44,000 local churches in the denomination. There was also concern that emotional and spiritual storms could accompany decisions related to homosexuality, proposals to end guaranteed appointments for clergy and the establishment of a budget to fund international ministries. 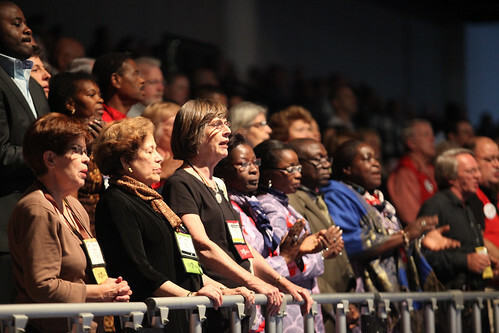 Delegates from Africa, Europe, the Philippines and the United States were welcomed to Tampa by hundreds of United Methodists from the Florida Annual (regional) Conference. Some presented new arrivals with beads and provided direction to several hotels in the Tampa Bay area. Before the service, delegates and visitors also visited an exhibit area that featured ministries of general agencies, Imagine No Malaria, Africa University, and purchased books and products of Cokesbury, the retail arm of the United Methodist Publishing House. Some delegates also attended a morning news conference in which Bishop Mary Ann Swenson of the California-Pacific Conference urged delegates to call for the divesting of church funds from three companies said to support the Israeli occupation of Palestinian territories. A second news conference highlighted the work of the United Methodist Global Aids Fund. The Rev. Donald Messer noted that the fund was created at the 2004 General Conference and has since raised $3.5 million. As always, delegates and visitors embraced friends they haven't seen for four years and they helped one another find their way around the Tampa Convention Center, a location with which they will become quite familiar before the assembly adjourns on Friday evening, May 4. "Over the course of the next 10 days, we will be stretched and pulled in many directions," said Goodpaster in the opening worship service. "We will be at times overwhelmed by the sheer volume of paper, people and programs. We will fall exhausted into our beds, and rise with very little sleep for the next day of significant decision making." But the bishop assured the assembly that "Jesus will show up here in Tampa while we are busy with our nets."